and DVDs I have enjoyed since I first encountered him and his work in the 1970s. Des the Viking warrior is exactly right: why had I never thought of that before? so grab one while there are copies still available. Well done Des. Great Days indeed! For a free downloadable poster and further information please click...(here). 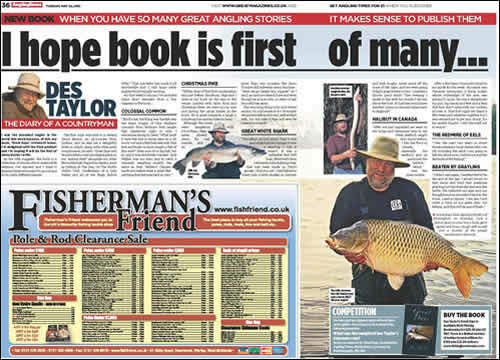 To read an article in the Angling Times about this book please click on image below (PDF 2MB). beer, and enjoy the words of an angler that has enjoyed some truly great days fishing. Hardback Editions £29.99 plus £5.00 P&P. As publishers, FISHING BOOK SENDER are in my opinion the best in the business. There customer service is first class, the information on products available/forthcoming on the web site is constantly updated, and the quality of the books is outstanding !! Other publishers need to take note and learn!!!! Des has opened the readers eyes that fishing is not just about catching a fish, but more so the whole experience of being outdoors,with wildlife and countryside all around you,and the lifelong friendships made, it lets you into the whole picture, and not just the thrill of the catch.Des's first book but surly not the last..... And yet again another beautiful leatherbound from David and F.B.S. I suppose when you review any book it is important to divulge any impartiality at the outset otherwise there’s always a lingering suspicion that it might not be a totally fair and honest review. After all, most folk will do a favour for a mate if they get a chance, won’t they? Well, let’s set the record straight. I’ve known Des for two decades or more and fished with him on many occasions. I’ve stayed with his family, gone to parties and we’ve shared holiday accommodation with our wives. However, we’re both strong willed and have crossed swords over trivialities, most recently when I suggested his column in Angling Times should be about fishing rather than spectating the Bewdley Hunt at some God forsaken hour on Boxing Day morning and I mention this to establish that if I thought his book was crap I would say so and he would expect nothing less. 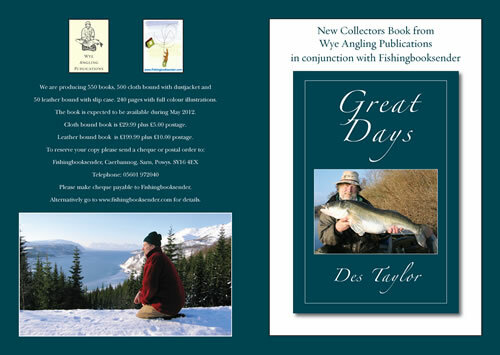 I have just finished reading "Great Days" by Des Taylor, and must admit it is THE most inspiring book , I have read in ages, in fact I'm off fishing now! None of the sometimes controversial DES I was expecting, well done again to all involved. Hi David Des Taylor Leather arrived this morning and I have to say you have produced another wonderful book. as you do it is very much appreciated.